If you enjoy container-gardening, include some ranunculus tubers (Ranunculus spp.) in your pots, either by themselves or mixed with other plants. 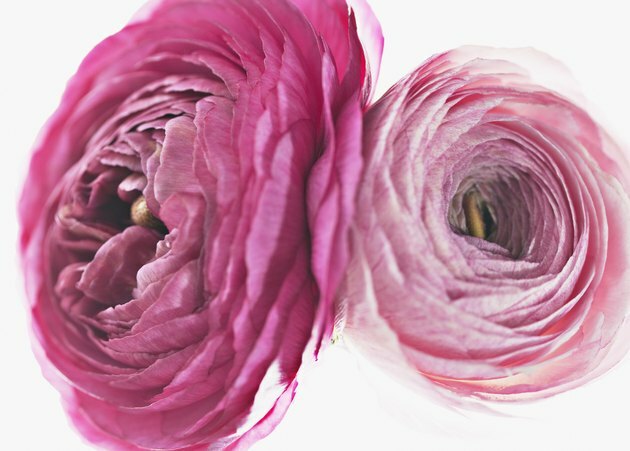 The most commonly grown variety, called the Persian buttercup (Ranunculus asiaticus), has cup-shaped flowers that resemble poppies, with petals in many bright colors and prominent purple-black anthers for strong contrast. Growing this plant in a container is usually trouble-free, provided it gets bright light and you don't neglect your plant. Persian buttercup is a frost-tender, herbaceous perennial that grows outdoors year round in U.S. Department of Agriculture plant hardiness zones 8 through 10. For container growing, the time you choose to plant Persian buttercups helps determine when flowers appear. If you want your plant to bloom in the spring, start plants in late summer or early fall and allow foliage to grow during the winter, either outdoors in warm-winter areas -- USDA zones 8 through 10 -- or indoors if live in USDA zone 7 or below, where there are cold winter temperatures. For flowers in late summer, start pots indoors in spring, a few weeks before your last expected frost in cold areas. Just make sure the cold season is actually over and not pulling one over on you. These plants will revert to a spring-blooming schedule in subsequent years, so if you want summer flowers in future years, treat the plants as annuals, re-potting new ones each spring. You'll have Instagrammable plants in no time. Persian buttercup grows from a special bulb called a tuber that resembles a fleshy claw with pointed "fingers." Tubers come in different sizes, with jumbos about 3 inches in circumference and producing about 35 flowers each, while smaller tubers -- "number twos" -- are only about 2 inches in circumference and develop fewer flowers. When planting in a container, set smaller tubers about 4 inches apart, but allow about 12 inches between jumbo tubers. For example, for a 10-inch pot, plant two or three small tubers, or one jumbo-sized tuber. Plant tubers with pointed ends -- or fingers -- downward in any commercial potting soil, setting each about 2 inches deep. Water the pot thoroughly, then wait until you see sprouts to water again to prevent rotting of the tubers. No one wants rotting plants in their home so just be super cautious. If you grow potted Persian buttercups outdoors, keep the container in full sun for best flowering. A spot in a bright, south- or west-facing window is ideal. This plant requires regular moisture but also needs good drainage. It will not reach its optimal growth in soil that's wet or soggy. Water whenever the top inch or two of soil feels dry to the touch, but allow the pot to drain fully and never keep it in a water-filled saucer. Add about two inches of organic mulch to the soil's surface to help conserve soil moisture, but keep it back an inch or two from the plant's center to discourage fungal growth. This plant doesn't require fertilization, but feeding at planting and every two weeks while actively growing or blooming will promote heavy flowering. Use a balanced, 20-20-20 water-soluble formula, diluted at a rate of 1/2 teaspoon per gallon at planting and then at half-strength later on, but check your product label for further directions. Use the fertilizer solution in place of a regular watering. To keep potted plants for the following year, allow leaves to remain on the plant after flowering. They'll eventually yellow and dry up as tubers become dormant. Store the pot in a cool but frost-free spot for a few months until new growth appears, then resume watering.